Home > Golf > Tiger Woods wins his 5th Masters! 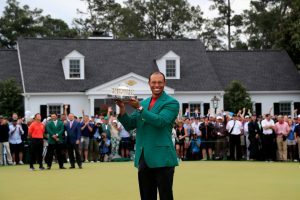 The roars began when he entered the 18th tee box, reached a crescendo when he approached the green and rattled the pristine Augusta National course once he sank his final putt and spectators began chanting his name. Tiger Woods has done it again. For the fifth time in his illustrious career, Woods is a Masters champion. How sweet it is!